Terrance Kellom’s father Kevin Kellom says, “What kind of lottery do you win for someone killing your son in your presence?” in response to comment by David Griem, attorney for ICE agent who shot his son. 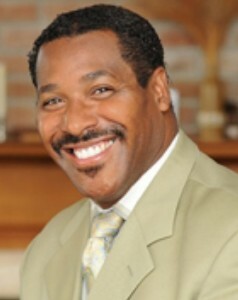 He again said his son was assassinated. Kellom’s mother Nelda Kellom is at left. 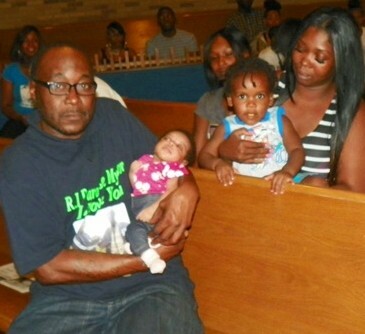 Kevin Kellom holds his son’s newborn daughter Terranae Destiny Kellom as his infant son Terrance Desmond Kellom looks on. 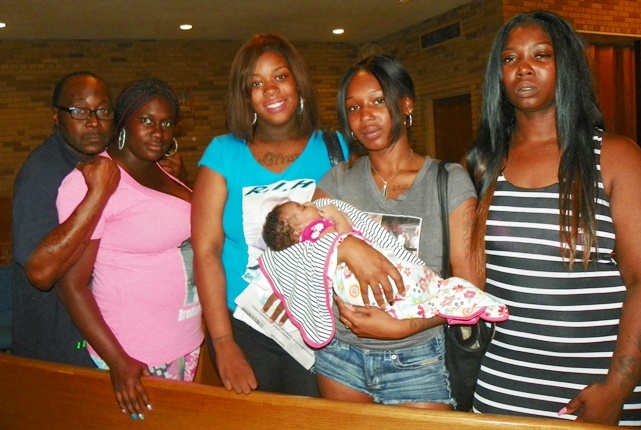 DETROIT – Janay Williams, mother of Terrance Kellom’s newborn daughter Terranae and his son Terrance, brought the infants to a rally for their father June 15, 2015. They joined his parents, other family members, and community members in calling for charges to be brought against Terrance’s killer(s). Kellom did not live to see Terranae’s birth, which he was anxiously awaiting. 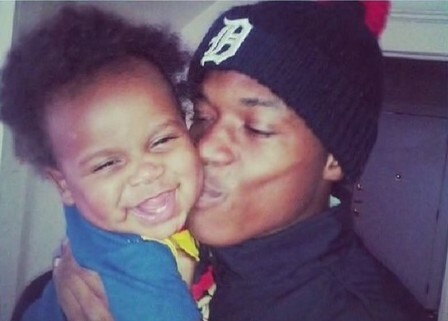 During the rally, the family’s attorney Karri Mitchell called the 19-year-old’s death April 25 an “execution without a trial.” It was carried out by a multi-jurisdictional police task force including Immigrations and Customs Enforcement Agent (ICE) Mitchell Quinn, and many Detroit police. The force invaded his father Kevin Kellom’s home without a search warrant and shot the young man multiple times to death in front of his father. Prosecutor Kym Worthy consults with assistants, including Robert Moran at right. 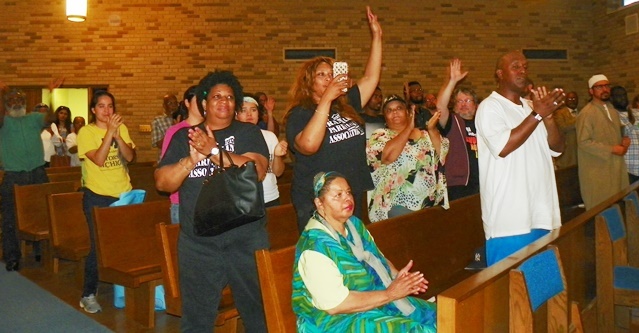 Those attending the rally, organized by Michigan United, Black Lives Matter-Detroit, the Franklin Park Association, the Detroit Coalition Against Police Brutality, Inc., and others, demanded to know why Wayne County Prosecutor Kym Worthy is taking so long to investigate the case. In a highly unusual move, she has sealed all reports on the case, including the young man’s autopsy report, which is normally public information. No second autopsy was done in the case as in customary in disputed killings, particularly by police officers. The Medical Examiner’s office works to support police versions of homicides in some cases. 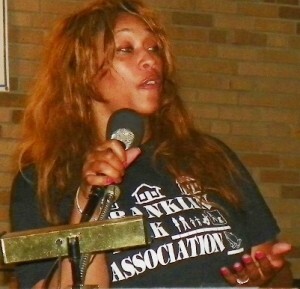 Arnetta Grable of the Original Detroit Coalition Against Police Brutality. Three-time killer cop Eugene Brown shot her son Lamar to death in 1996. 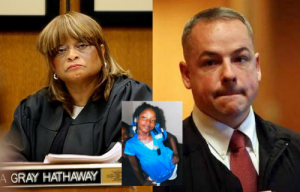 In the case of Aiyana Jones, 7, shot to death by Detroit officer Joseph Weekley in 2010, the Medical Examiner first reported that the entrance wound was in her throat and exit wound at the top of her head, which would have supported Weekley’s version of events. However, the ME changed his report to indicate the entrance wound was at the top of her head and the exit wound in her throat after family attorney Geoffrey Fieger had a second autopsy done showing those results. Arnetta Grable of the Original Coalition Against Police Brutality said she had contacted Macomb County Medical Examiner Mark Spitz, who had agreed to come to the Trinity Chapel funeral home to do the second autopsy, likely in time for the planned funeral. However, according to family members, Pastor Curtis Williams, who owns the funeral home, told Mitchell that he would charge much more for the funeral if a second autopsy was done. Mitchell reportedly paid for the funeral. The Detroit Free Press and the Voice of Detroit filed Freedom of Information Act requests for the autopsy report, but to date they have not been granted. It is questionable whether Worthy has the authority to seal an autopsy report absent a judge’s order. Terrance Kellom kisses his son in earlier photo. The younger Kellom died of multiple gunshot wounds, at least one of which was in the back, according to Mitchell. 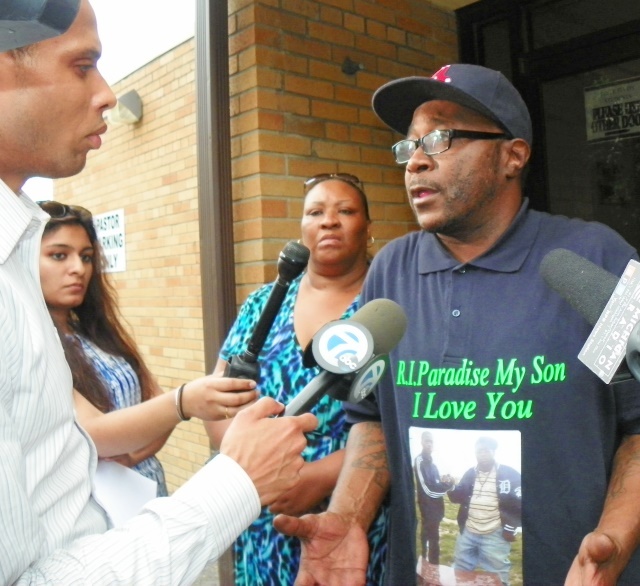 His father witnessed the shooting and has repeatedly denied police claims that his son came at Quinn, who Detroit police have identified as the shooter, with an axe. He said he was brought downstairs with two officers in front of him and two behind him. Kevin Kellom reacted with outrage and sorrow. He said he, Kevin’s mother Nelda Kellom, and the rest of his family want no money; they only want their son back. He added there was no need for the task force to invade his home to arrest his son on an outstanding warrant for armed robbery. Kellom said police had his home under surveillance that day, and saw him walk to a neighborhood gas station with Terrance. On the way back, he said, Terrance stopped in the street to tie his shoes. 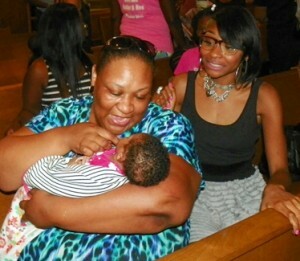 Nelda Kellom with granddaughter Terranae at rally. “They could have arrested him then,” Kellom said. Nelda Kellom said, “My son didn’t deserve to be killed the way he was killed,” but said she would be patient until the investigation concludes. Ron Scott, of the Detroit Coalition Against Police Brutality, Inc., said Prosecutor Worthy told him they would “probably have a statement” on the investigation within a week. 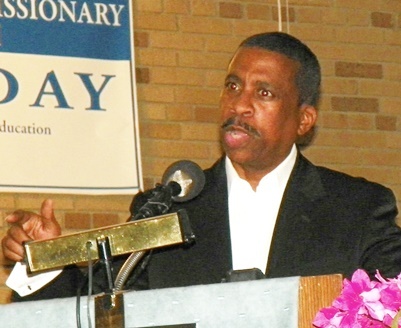 He also demanded an end to the use of multi-agency task forces by the Detroit Police Department, like the Fugitive Apprehension Task Force that killed Terrance Kellom. He said they are funded and armed from the federal level on down. Terrance Kellom’s stepmother Yvette Johnson during rally. During the rally, Mitchell denied he told local media, as quoted, that he had no problem with Worthy sealing the autopsy report. In fact, Joseph Weekley, who shot seven-year-old Aiyana Jones to death during a military-style “Special Response Team” raid on her home May 16, 2010, was charged with “involuntary manslaughter” by a one-man grand jury comprised of Third Judicial Circuit Court Criminal Division Chief Judge Timothy Kenny, 17 months after Aiyana’s death. At the same time, Worthy charged her father, Charles Jones, and “uncle” Chauncey Owens with murder. 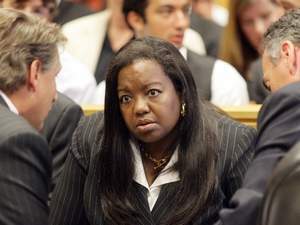 After Wayne County Circuit Court Judge Cynthia Gray Hathaway dismissed the manslaughter charges against Weekley during his third trial, his jury hung on the remaining charge of reckless use of a firearm and he walked scott-free. Aiyana’s father is serving a sentence of 40-60 years in prison for first-degree murder in the Je’Rean Blake case. Worthy, who took office in 2004 as the county’s first Black woman prosecutor, has never brought charges against any Detroit police officer in the fatal shooting of a civilian. 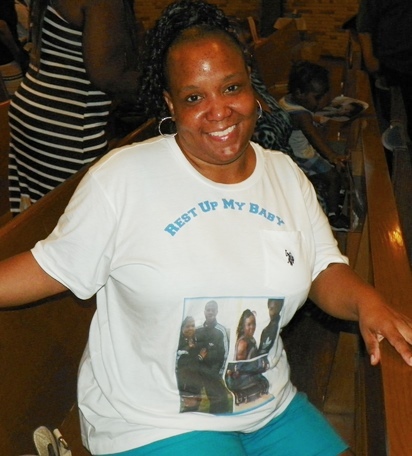 There have been dozens of cases during her tenure in which police killings, of young Black men in particular, appeared highly questionable, but were ruled “justifiable” by her office. During the rally June 15, Bobbie Johnson, President of the Franklin Park Association, expressed condolences to Kellom’s family and anger at police tactics and called on Worthy to answer to their community. 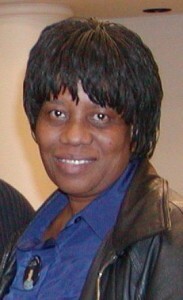 Bobbi Johnson of Franklin Park Association. 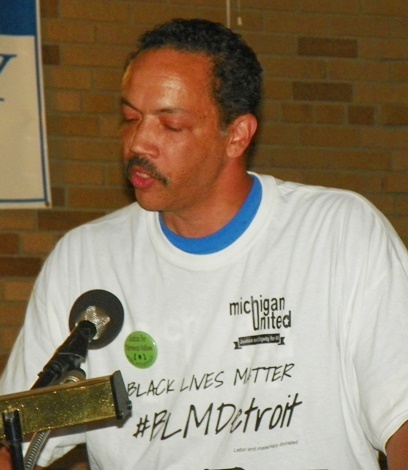 Eric Kelly of Michigan United, Black Lives Matter Detroit. Eric Kelly of Michigan United and Black Lives Matter said the rally is only a beginning. He said Black Lives Matter-Detroit meets every Saturday at 2 p.m. at the Trinosothes Café in Eastern Market to plan and mobilize against continuing police brutality in the city. He said charges that were brought against the Baltimore cops who killed Freddie Gray came about only because the people, especially the youth, took to the streets in open rebellion and demanded justice. 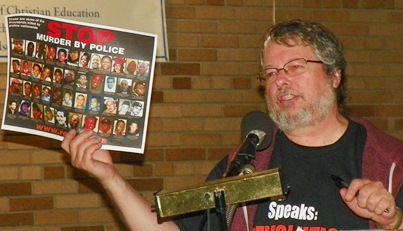 Gary of the October 22nd Coalition denounces killings by police across the U.S. Over 570 people have died at the hands of law enforcement in the U.S. since the beginning of 2015, according to the website killedbypolice.net. The raid on the Kellom home was part of a series of neighborhood raids dubbed “Operation Restore Order” by Detroit police chief James Craig. The latest in the series, sub-titled “Operation Double-Down,” just took place June 18 on the city’s west-side. Part of large crowd that attended rally for Terrance Kellom applauds speakers. This entry was posted in Uncategorized and tagged BLM, BLMDetroit, TerranceKellum. Bookmark the permalink.